The beautiful blue Islands of Andaman and Nicobar are considered an exotic getaway for the honeymoon couples planning tour packages to celebrate their initial stages of growing intimacy. Andamans is not overly crowded; at least there would be a lot many beaches that are secluded and provides ample solitude and privacy to honeymoon couples. Andaman is also known for being very safe for romping on the beaches late night or early morning. It is also known for a wide variety of adventure games and sports conducted under strict supervision of experts and supervisors. The pleasant maritime climate of Andamans is a heavenly escapade for the honeymoon couples from Delhi. It gives a chance to escape from the gruelling and oppressive summer and winter temperatures of the capital. There are no direct flights from Delhi to Port Blair. Neither is there a direct ship or water way from Delhi. The flights from Delhi scheduled to Port Blair are via Vishakhapatnam, Kolkata, Chennai etc. There are more than 30 flights operated by various service providers such as like Air India, IndiGo, JetLite, Spice Jet, Jet Airways, Kingfisher Airlines and GoAir from New Delhi to Port Blair. Among these the most popular ones are IndiGo Airlines, Jet Airways, Vistara. Air distance from Delhi to Port Blair is around 2481 kms. Flight time varies from 4 hours 50 minutes to as long as 20 hours depending on the number of stopovers and the length of stopover. The stopover time is generally around 1 hour but can be an extended one depending on the service provider/airlines you choose. Andaman is quite a popular destination from the tourist point of view from Delhi and it is easy to book cheap flights. Coupon codes and cash back offers can be availed to get cheaper air fare deals. The earliest flight from New Delhi is scheduled as early as 2.30 a.m. to reach Port Blair. The last flight of the day is scheduled at 21.30 p.m. departure from New Delhi. The honeymoon couples reaching these groups of remote Islands are usually delighted by the natural beauty of the forests, seas and beaches. Delhi being far off from the coast experiences extreme climatic conditions. Thus the pleasant sea climate of Andamans offers a delightful experience to the honeymoon couples. Explore the best of honeymoon package deals at the lowest of prices. 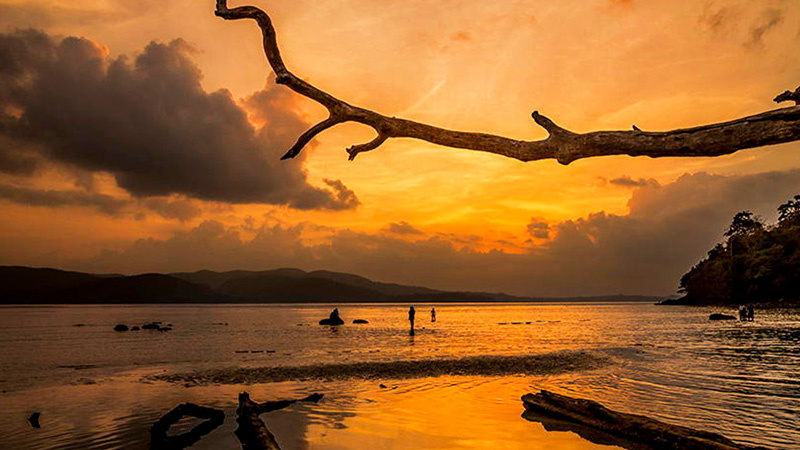 Andamans is a special destination to create magical memories. It is the destination to carry unforgettable memories back home for all honeymoon couples. All honeymoon couples fall in love with the enigmatic beauty of the magical islands apart from falling in love with each other. An intimate dinner on the beach, a peaceful solitary cruise in the calm blue seas, a stay on a beach island overlooking the gorgeous sunset will leave you pleasantly surprised and love-struck.